A real ‘stick-to-your-ribs’ kinda recipe. Comfort food at it’s best. This recipe is perfect on a cold, wintery day, when you’re pretty sure summer is never going to come again. Pinto Beans with Pork Necks is made in your crock-pot or slow cooker, depending on what you call it. Either way, this recipe is down-home, comfort food at it’s best. 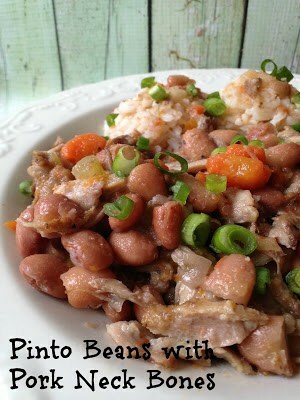 Pinto Beans with Pork Necks can be served with long grain rice, mashed potatoes or extra wide egg noodles. Hey, get back here!! Don’t run away!! Don’t let the long list of ingredients and the long directions scare you away. This recipe is well worth the time and effort it takes to make. It’s delicious, nutritious and very economical. Steps 1 through 5 can be done a day or two in advance, so most of the prep work will be already done on ‘cook day.’ This recipe makes enough to feed a family of two, four or six, depending on your family’s appetites. Serve this hearty stew like meal with robust beer or apple cider. Recipe Note: You can substitute smoked pork necks in this recipe, just reduce the amount of salt called for in recipe and adjust accordingly. Place sorted pinto beans into a large bowl. Cover with 6 cups water. Let beans soak 8 to 12 hours or overnight. Pour beans and water into a large saucepan. Bring beans to a boil, reduce heat and simmer for one hour. Remove from heat and drain. Set aside. 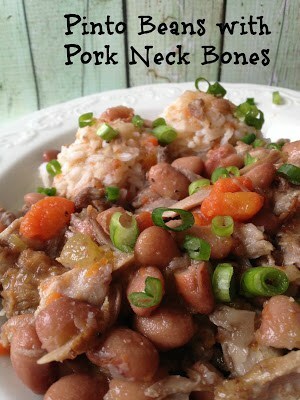 In a large kettle, add cleaned and rinsed pork neck bones. Cover with water. Bring to a boil; reduce heat and simmer for 1 hour. Remove from heat, drain. Heat oven to 400º Place pork necks on a large baking sheet. Roast in oven for 30 minutes. In a large skillet over medium high heat, add olive oil, onions, garlic, salt and pepper. Cook, stirring frequently, for about 10 minutes. Place the onion mixture, pork neck bones, beans, water or stock, apple cider vinegar and remaining seasonings in a 6-quart (or larger) slow cooker. Cook on low for 8 hours. About two hours before the cooking time is completed, remove the pork neck bones from the slow cooker and let them cool enough to handle. 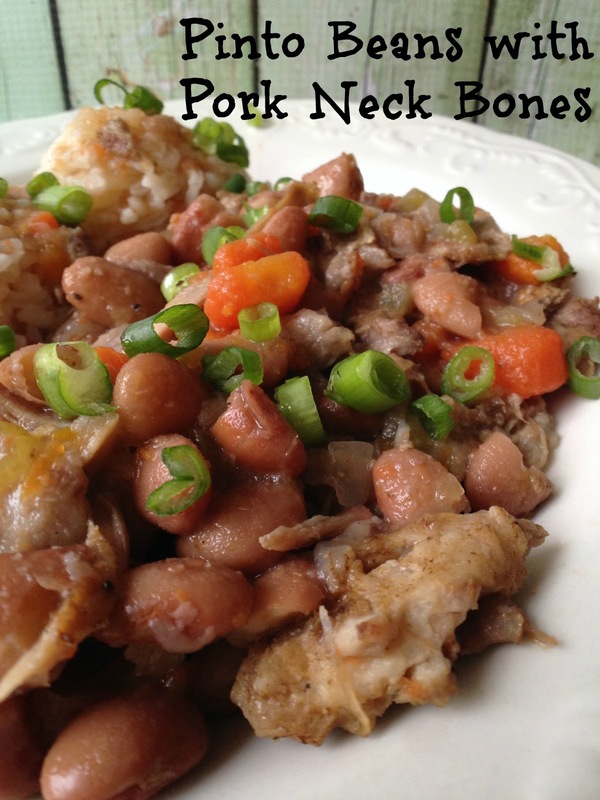 Remove the meat and discard the bones and fat from the neck bones. 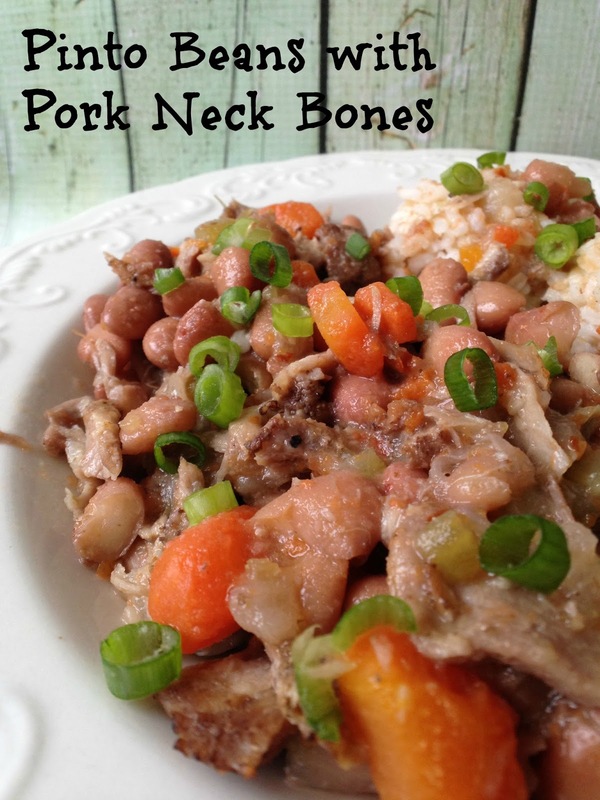 Chop or shred the meat and return it back to the slow cooker, turn the slow cooker to high and cook until the beans are completely tender or for an additional hour. 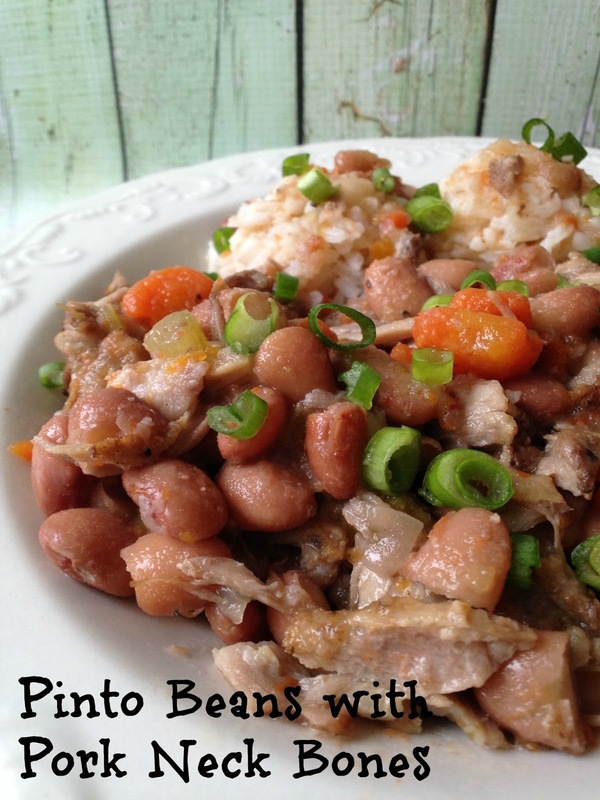 Serve the pork and pinto beans over cooked rice. Garnish with parsley flakes. 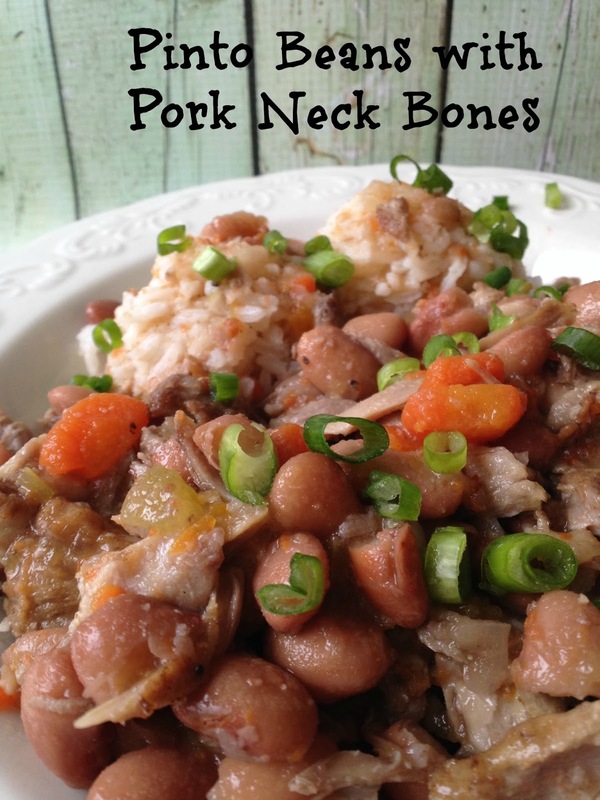 Could you use a frozen pork shoulder bone that has already been BBQed? I think this may become my newest favorite recipe. I've never know what to do with the neck bones I see at the market. Now I do. With all the ingredients and steps insures these will be delicious. I think with a bar-b-cue these as a side would be the star! I think your right, perfect for a bar-b-cue!